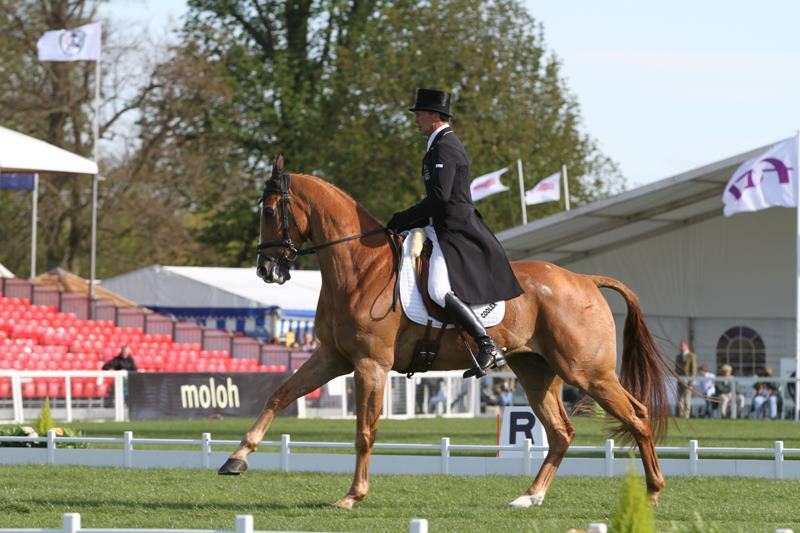 Badminton Saturday – Dressage Day Two. 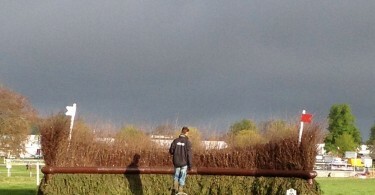 Sunshine and showers, and another packed day of dressage. Even as an eventing and dressage certified nutter, 2 full days of watching the same test can get to be A Bit Much, but honestly, this was the best day’s dressage I’ve ever watched, I was absolutely rivetted till the end, and went slightly mad on Twitter to keep everyone posted! Check out that reach. Jaw-dropping. There was a chilly wind blowing which upset some horses, plus the atmosphere in the arena became far more electric than yesterday, which was probably perfectly balanced by the improvement in the judges’ marks on the second day. 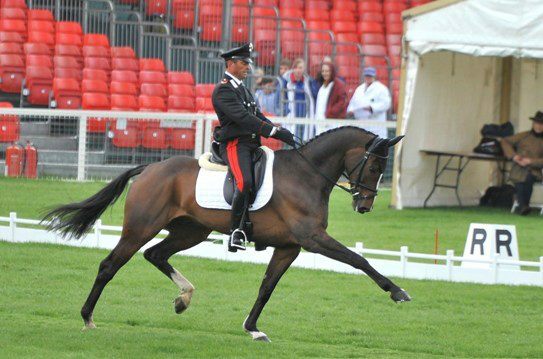 Swings and roundabouts of modern dressage… discuss. Lots of tests could have been leaders but were spoilt by just a few movements, the rein back to canter and the changes being particular culprits. He is such a fabulous mover and Stefano had him going quite sensationally well, so much so that dressage queen Anna Ross Davis, commentating for Horse and Hound and sitting a few seats up from me in the Media Centre, was absolute amazed by him, and said she’s never ever seen an event horse do dressage like that. Sure enough, he nailed 9,9,9 for the medium trot, 9,9,10 for the extended, in an absolutely super test, and 9,8,9 for his riding, to break the mythical 40 barrier, and score 36.0. 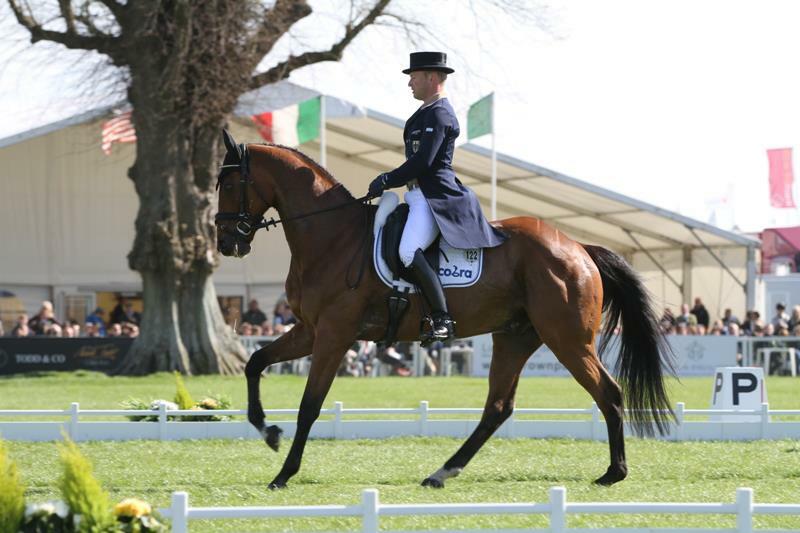 He’s been based with Andrew Nicholson for a while so I think we can probably expect a speedier Stefano than ever before on the XC. Must say I would LOVE to see him win this! Sandra Auffarth had Opgun Louvo, individual Bronze medallists at Greenwich, beautifully balanced and expressive, but the halt and reinback went pear-shaped due to tension and dragged their marks down, although she got him back and nailed 888 for 1 change, for a final mark of 41.3. I love this partnership and he’s a sensational show-jumper, keep your eye on them. Ingrid Klimke’s Butts Abraxxas got very tense in the rein-back and some of the changes, marring an almost superlative test, she finished on 44.2 but if he’d settled she could have led. Dirk Schrade nailed his colours to the mast with an 8, 8, 10 for entry. The only blip was the walk, with 5,5,5, 6,4,4, but still good enough for eventual 3rd place. Tiana Coudray and Ringwood Magister for the USA were fantastic, he has such knee action and elevation that he doesn’t get enormous marks for his extensions, but the rest of the movements were exceptionally good, and they are in 10th= with Sam Griffiths, who was 2nd overnight. The final session featured one sensational combination after another. Miner’s Frolic was, unusually, a little unsettled Tina Cook which really spoilt things, and she looked a little rueful at the end. 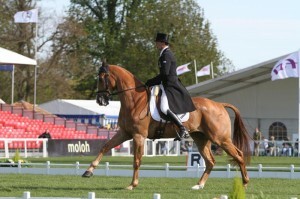 Jock Paget and Clifton Promise were excellent, and got the marks they deserved, for 39.7. I think he was harshly marked yesterday so it was great to see him get super marks today. Michael and Sam. I run out of superlatives. Just beautiful to watch. Michael Jung’s test was almost flawless, mostly 8’s with some 7’s, presented in totally consistent balance, power and frame, staying totally permeable to Michael’s imperceptible aids. The rein-back was the only blip, dropping to 6,6,5, in a stunningly consistent test. It was not as breathtaking as Stefano and Apollo in the extensions, and I would have put Stefano above Michael (as would Anna Ross Davis), but it was a jaw-droppingly lovely test to watch. 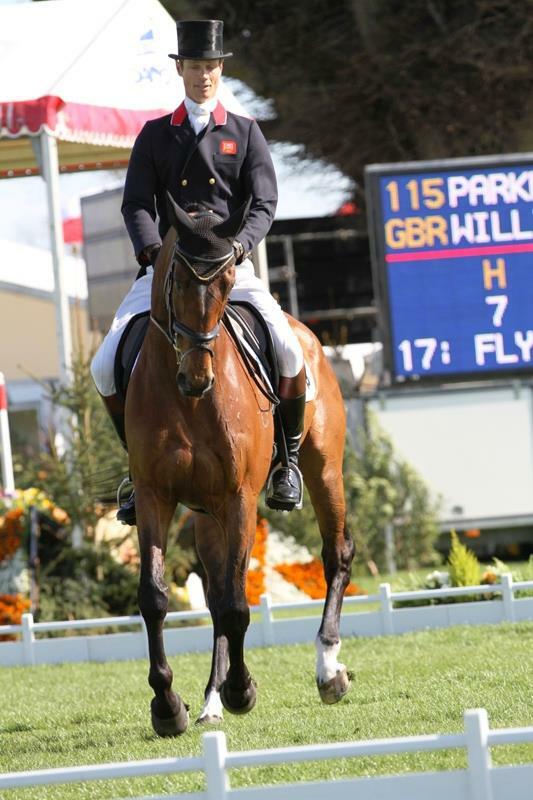 Their partnership is immense and we should ALL thank our lucky stars that this horse did not get sold, they are Eventing’s version of Edward and Toti, the dream combination. I don’t care what country a rider is from, I worship fabulous horsemanship such as this! William Fox-Pitt, like Michael, had his only blip in the rein-back, dropping to 5,5,5, but still scoring 40.0 to be the best Brit. Andrew Nicholson on Nereo was the only rider to nail two 10’s. His 6,5,4 and 4,4,4 for the walk work dragged him right down, and the changes weren’t perfect, but he secured 9,9,9 for his riding and 40.2. Pippa Funnell is back. She had “Red” going beautifully outside but the tension got to him a little, resulting in a few 6’s sprinkled around, but her superlative presentation meant they finished on 41.3 in 7=, 2nd best of the Brits and one of only 2 in the top 10. For those fascinated by the Team William vs Team Andrew Grand Slam duel, Andrew has horses in 6th and 14th, and William’s are in 5th and 16th. Nail-bitingly close. Chris Burton, yesterday’s leader, is in 9th, and if he’d gone today I suspect he’d be a few places higher. Some of the judging today was very confusing, to say the least, sometimes I wondered if they were judging the same movement. Tina Cook got 7,2,3 for the rein-back. There is NO way a difference of angle of view should make a 5-mark difference. Lucy Jackson got 6,4,7 for her final flying change… again, very odd marking. Scores at the top are seriously close together, so expect a major shuffle-around tomorrow, I don’t think this is going to be a dressage competition! Dirk Schrade thinks there will be problems all round the course, that it is a full test, every question is asked. He exhibited the typical German sense of humour. Asked which part of the test he was most happy with, he replied “I am happy that I go in and stop and my horse stands still” which got a ripple of laughter. I asked whether it is true that he doesn’t suffer any nerves (as was reported a week ago in Horse and Hound) and he replied that of course, everyone has some nerves before the XC. He expects the course to cause a lot of problems. Tomorrow is going to be a fantastic competition, if you are in doubt about coming, move heaven and earth, it’s going to be one to boast about having seen. Good Luck to all competitors. I’m off to walk the course and see what I can glean… ciao for now. 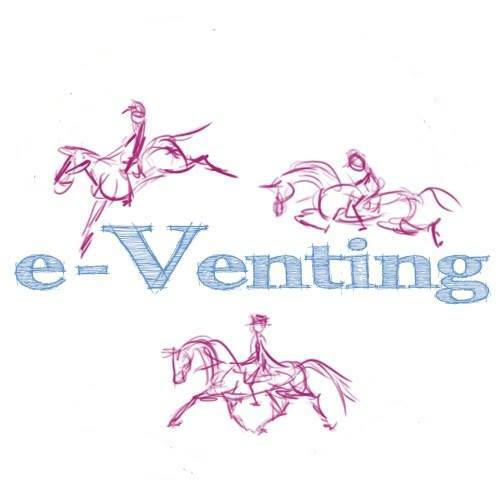 For those who can’t watch it tomorrow, I’ll be Tweeting ‘live action’ all day on the @EventRidersAssoc account and the @e-Venting account (if the first bombs out) and will switch to my personal @kerilli account if I get really pushed. XC starts at 12.00, not 11 as it used to! All photos by Katie Mortimore apart from the photo of Stefano and Apollo, which is by Liz Awty. 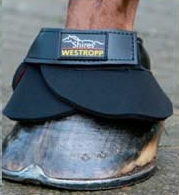 Over-reach Boots for the jumping phases: yes or no? Super photo of Apollo! Will be really interesting to see if Andrew has made this combination quicker xc, they will be truly world-class if that is the case! Andrew may rue it if so! 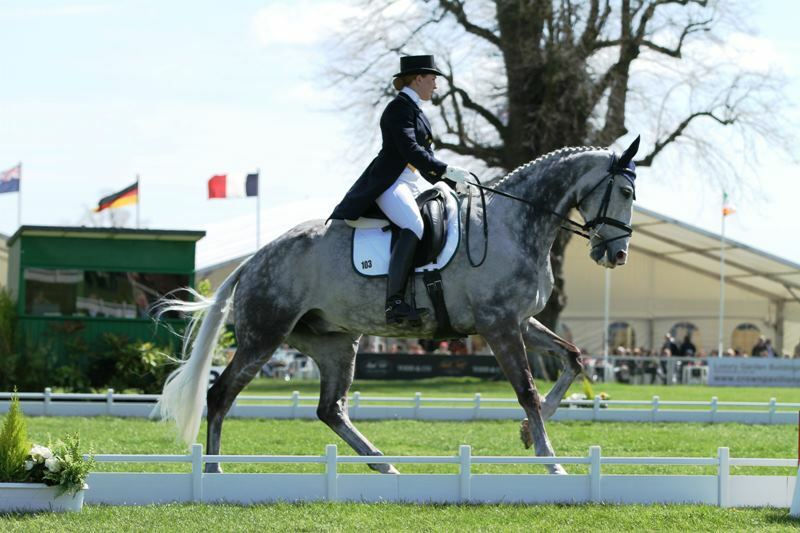 Pammy Hutton’s comments on the radio are very similar to yours, regarding the dressage judging and I think Judy suggested having a judge to oversee really errant marks and they are doing? in pure dressage.